Effective marketing can mean the difference between runaway successes and costly flops. Covering everything from customer programs to ad campaigns to sales promotions, this is every marketer’s hands-on guide to turning opportunities into profits. No project management training? No problem! In today’s workplace, employees are routinely expected to coordinate and manage projects. 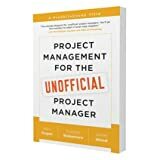 Yet, chances are, you aren’t formally trained in managing projectsyou’re an unofficial project manager.